Deputy President of DCU Daire Keogh. Credit: Micheál Ó Scannáil. Refereeing scholarships were granted by DCU’s Sports Development Service at last week’s sports scholarship ceremony for the first time in college history. 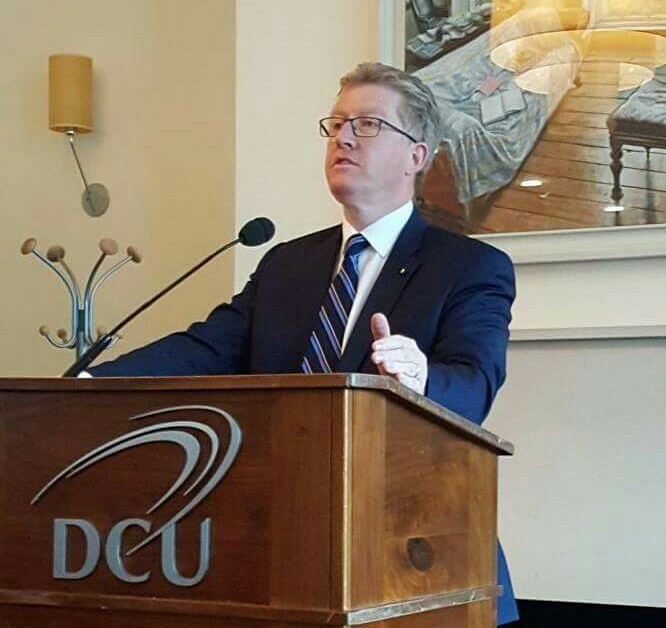 Deputy President of DCU Daire Keogh handed out 75 scholarships, with six budding referees who adjudicate for the sports of Gaelic football, football, archery and gymnastics among the awarded. Senior intercounty football referee David Gough advised the student referees that the most important quality they can display is a tough moral compass. “You have to be able to make the right decision at the given time,” said Gough. Also in receipt of sports scholarships were Aoife McNicholl and Emer O’Sullivan, who will compete for the Irish national team at the power chair football world cup this summer. “The only difference between the levels of scholarship is funding,” he said. “We have educational workshops covering topics like resilience, time management, how to live like a high performance athlete, nutrition and recovery that are available for all athletes. One problem for high grade athletes is balancing their sport with their college work. In UCD athletes have the option to extend their course over an extra period of time to keep up with their studies. This system is not one that is in place in DCU, however, it is possible for students to organise their course so that they don’t fall behind in their studies, according to Head of the School of Law and Government Gary Murphy, who has dealt with elite athletes in the past and currently has Irish under-20’s rugby star Paul Boyle and Greta Streimikyte, who represented Ireland in the Paralympics last year, under his faculty. “We want to ensure that the students benefit from the education we give them even though they might be out of the class more than other students, that’s why we are always here to help,” he said.